An online oddity has been taking place while you slept, and I’m not just talking about the seemingly cataclysmic internet bug branded #Heartbleed. Rather, I’m referring to the lack of customer communication and service from those institutions who may be affected – Heartbleed being the global security glitch affecting millions of online sites that, if unrepaired, could leave them vulnerable to unwittingly exposing your account details. In essence, leaving you open to malicious attack. The detail of my knowledge on this extends about as far as the articles being circulated, and even then my level of understanding clearly distinguishes me as a Communications professional with strong interest in digital strategy from a digital diva with techy knowledge. The best current advice as I draft this, from Mashable for example, is not to rush out to change all your passwords just yet. 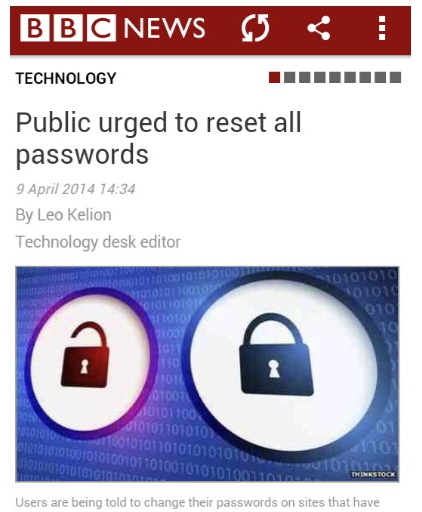 This is in contrast to some early advice which encouraged people to change all passwords immediately. Don’t. If the security fix hasn’t been put in place by the host, you are doing nothing to improve your protection by changing your password. Mashable advise making sure that the organisation with whom you have your account – be it bank account or social media account – take appropriate action in the first place (if they need to), before you do. Initial public advice from companies as reported in the news, urging reseting all passwords, has since been tempered, to changing them once a fix has been put in place. And that is where it seems that you weren’t the only one sleeping. Of the many institutions, organisations, companies, platforms and entities I do personal business with, not one has yet been proactively in touch. Not one. No one has offered me advice or sought to reassure me about the steps they’re taking, if any, to protect my interests and personal data, and what subsequent action I should be prepared to take. I do however see plenty of activity on social media. You’ve got to go to where people live. In emergency circumstances resources need to be channelled to where they are needed most. However in a crisis – and to me this could easily turn into one of sorts – early, accurate, informative, and measured communication and engagement is crucial in preventing escalation into a disaster or reputational catastrophe. I’m not witnessing any flow of information, suggesting that either this isn’t as sensitive or widespread as some are leading us to believe, or there is a global apathy and lack of understanding about the vital role communication and customer service teams have in crisis management. Having integrated plans agreed at every level and ready to roll, which incorporate sound understanding of the value of digital engagement – not just broadcasting, though I’m not even seeing that at the moment – is the very minimum I’d expect. Go wild. Understand your audiences. Reach out to them. Prepare positional statements and key messages when the time is right. Analyse the landscape and respond. Put spokespeople up for interview (regularly refreshing their media handling skills throughout the year). Engage. Strangely, TV channels seem to be overlooking the news, perhaps preparing to invest in a sustained burst of activity as morning arrives. Though as they flick through the morning’s front pages, there seems little indication that is going to be the case. As I draft this in the wee hours of 10 April (UK time), BBC’s top stories focus on Maria Miller MP, Lord Myners resigning from the Co-op Group Board, the PC Blakelock murder trial verdict, Oscar Pistorius’s trial, violence in Venezuala, and Prince Baby George’s visit to New Zealand. Sky News isn’t much different, with some additional sport news. Maybe the fuss will be over in a heartbeat. If so, then take Heartbleed as a health warning. When principles of communication and emergency planning aren’t established in periods of rude health, upon which the foundations of quality (digital) customer service and engagement can be evolved, then ability to effectively engage in times of need will become restricted faster than a rupturing artery kills. My heart bleeds for quality customer service. Don’t just add a little bit plaster or wait until it’s time to resuscitate. Keep your finger on the pulse and invigorate and investigate before it’s too late. It could be the difference between strife and breath.